With Halloween right around the corner, the connection between chocolate and slave and/or child labor is particularly timely. According to the US Department of Labor's 2009 report, "List of Goods Produced by Child Labor or Forced Labor," cocoa has been found guilty on both counts. Rather than being immobilized or depressed by the fact that much of the candy given out on Halloween will be tainted by slavery, Global Exchange has started a campaign called "Reverse Trick-or-Treating." The concept is simple: instead of taking candy, children and adults go trick-or-treating and give the households they visit fair-trade chocolate and cards explaining the connection between slavery and chocolate and ways to change this abuse. This year marks the third year of the campaign. According to Global Exchange, "Ten to twenty thousand groups of children will hand chocolate back to adults during their regular neighborhood trick-or-treating rounds this Halloween. The children will distribute Fair Trade certified chocolate attached to a card explaining the labor and environmental problems in the cocoa industry globally and how Fair Trade provides a solution." Last year I participated, and having the chance to speak with approximately 100 people about human trafficking and chocolate was extremely rewarding. The houses we visited were receptive to the information, and my friends and I had some great conversations around this issue. 2009 has been a year of progress and increased awareness, though this problem still persists. In August, Interpol rescued 54 children from plantations in the Cote d'Ivoire. The children, "aged between 11 and 16. . . told investigators they would regularly work 12 hours a day and receive no salary or education." Global Exchange argues that this "demonstrates that the chocolate industry has still not gone far enough to end child slavery and trafficking in the cocoa fields." In 2009, Cabury became the first major chocolate brand to receive fair-trade certification in the UK; activists are pressuring Hershey's to follow suite in the US. 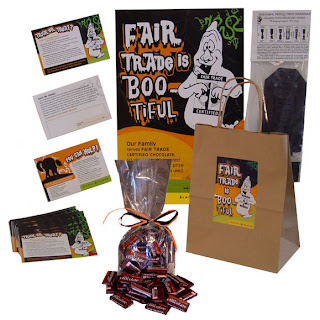 While the free kits distributed by Global Exchange have already been claimed, people who want to participate in reverse trick-or-treating can download the information card or flyer, and purchase fair-trade chocolate to create their own kits. A Spanish version of the card is also available. Global Exchange can be reached at fairtrade@globalexchange.org.